On September 4, 1994 (2 years after my conversion) I walked down the aisle of a Missionary Baptist Church (BMA) and "surrendered to preach". I said to the preacher something to the effect of, "I feel the Lord calling me to the ministry." The preacher rejoiced with me, shared it with the church at the end of the invitation, and... well... that was all there was to it. Oh - and I preached my first sermon the following Sunday evening before a full house of my church, my family, and friends. I immediately enrolled in a local Bible College to pursue an education to help me fulfill my calling. My name was listed in the BMA state paper as having surrendered to the ministry and was "available for preaching appointments as the Lord leads". That's how you did it. I would get - every couple of months or so - calls from churches needing to fill their pulpit while the pastor was on vacation or while they were in between pastors. This gave me some good experience and exposed me to many sweet fellowships around the state of Arkansas. 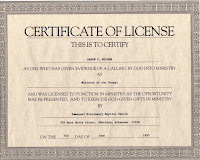 I was pursuing my ministry...I was fulfilling my calling. But was I really called? And if so, how did I know? How could I know? How can anyone know, if he is called to preach? This question - in some form or another - has occupied my mind many, many days over the past seven years. The significance of that particular time frame is that seven years ago, I was finishing my 4th year as Youth Pastor at great little church in Guy, Arkansas. In August, 1998, I stepped out of full time ministry for an undetermined season, to further my pastoral training as well as continue to discern just what God's call was on my life. I might - in a later post - journal through that process of how I came to the decision to step out of full time ministry, but for now, I just want to introduce my simple (and I trust, biblical) "philosophy" or "theology" of "the call". The saying is trustworthy: If anyone aspires to the office of overseer, he desires a noble task. 2 Therefore an overseer must be above reproach, the husband of one wife, sober-minded, self-controlled, respectable, hospitable, able to teach, 3 not a drunkard, not violent but gentle, not quarrelsome, not a lover of money. 4 He must manage his own household well, with all dignity keeping his children submissive, 5 for if someone does not know how to manage his own household, how will he care for God's church? 6 He must not be a recent convert, or he may become puffed up with conceit and fall into the condemnation of the devil. 7 Moreover, he must be well thought of by outsiders, so that he may not fall into disgrace, into a snare of the devil. I see two basic elements to this passage which details the qualifications of an elder/overseer/pastor. The first element is subjective, the second element is objective. The subjective element is the "desire" or "aspiration". This is subjective in that it is inward - known only to you & the Lord , so no one else can really see. And, it's rather difficult to discern. For instance, is it a call to preach...or is it a vain desire to get in front of a bunch of people and let them hear you speak? (This tends to be one of my ongoing struggles). Is it a call to public ministry? If so, what particular ministry... missions, pastoral, teaching (college level, seminary level), music? Is there even such a "call" for these types of ministries? It seems difficult to determine. Shew! Quite a list, huh? Any takers?! Now, to be fair, there is also an element of subjectivity to this objective list. I.e., HOW hospitable does an elder need to be? HOW long must he be converted before being considered? How respectable, how self-controlled, etc. So, here's the way I see these two elements working in harmony. I see the objective elements - or qualifications - as being helpful indicators of whether or not the subjective element (the desire) is really of God. Extreme example - if I've got a hot temper, my children are wayward, I have no self-control, then, there are two definite possibilities. One, I'm not qualified and therefore not called. Now, I know what you're thinking. 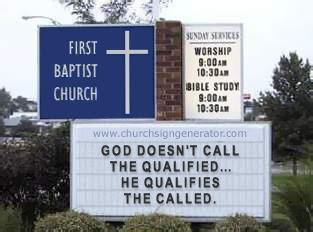 You're thinking, but wait...doesn't the Bible say somewhere "God doesn't call the qualified, He qualifies the called"? Well, I'm sure the Bible doesn't say it quite like that, but I can agree with that statement for the most part and even think it helps prove my case. If God isn't "qualifying" you, then He ain't "calling" you. The other option here is that I am called, but failing in these areas at the moment, and should possibly step down to allow time to work on these areas through God's grace via prayer, personal time in the Word, Biblical counseling, etc. Either way, the objective helps clarify the subjective. To say it another way, to the extent that a man is meeting the objective criteria of elder qualifications set forth in 1 Timothy 3:2-7 (Cf. Titus 1:6ff & 1 Peter 5) will help determine the legitimacy or genuiness of the subjective "desire" and "aspiration" found in 1 Timothy 3:1. 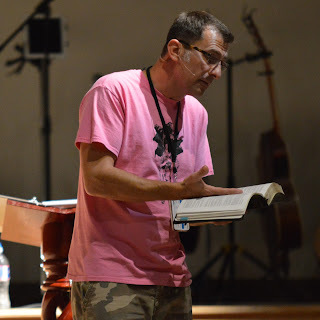 Or again - I can be more or less certain of the source of my desires and aspirations for ministry as I become more or less qualified according to Biblical standards. I'll leave it at that for now... but I've got more to say on the subject. What are your thoughts so far? Agree? Disagree? Great post and one to think about. I guess we need to remember that we are sinners, and one must look at the heart. ie... lets say you struggle with losing your temper... I don't think it disqualifies you from public ministry if you have a heart that is willing to change and trying to change. And you're accountable to someone as you work through that. Hi Samantha...welcome to I Am Chief. How'd you hear about the blog? You asked a good question - one that would take many more blog posts to answer! Each situation can be different - it would depend on the type of ministry he/she has - how "public" is it (is it a man preaching, or is it a woman singing in the choir). How would you define "struggle"? Has there been any signs of progress in this sin area? Etc. Lot's of questions could be asked to help determine each scenario. You are right - we must remember that we're sinners. And we must also remember that the passages listed in this post give clear qualifications for elders - in spite of their sin. True that Iamchief. You are very wise. I think sometimes as christians we can pick and choose which scriptures we like, and then the ones we don't like we shrug it under the carpet. I don't want to be like that. Thanks for challenging my thoughts. I have no idea how I found your blog... someone posted a comment on mne..\. and I think I read theirs... then I clicked on a comment someone wrote in theirs... clicked on another comment in this new persons... then clicked on your name in their blog roll.